Our Molle grenade pouches are fully Molle System compatible so you can quickly and easily mount them on any Molle compatible kits for convenient access wherever you are and whatever you are doing. 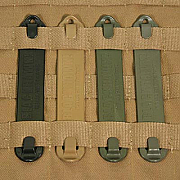 Blackhawk S.T.R.I.K.E Molle Speed Clips, flexible and durable clips for mounting / unmounting pouches and other gear quickly. Speed Clips are made of a modern carbon-fiber polymer material that is strong, flexible and durable. These are the most versatile new pieces of Molle hardware available. 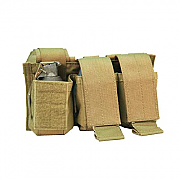 Blackhawk S.T.R.I.K.E Single Frag Grenade Pouch, Molle fitting and fast access grenade pouch. The Molle S.T.R.I.K.E Single Frag Grenade Pouch was designed by Blackhawk to aid in speed and ease during military operations and assaults. Blackhawk S.T.R.I.K.E Smoke Grenade Single Pouch, single smoke grenade pouch attachable to vest, bag or rucksack. This Blackhawk Molle S.T.R.I.K.E Smoke Grenade Single Pouch is ideal for mounting on any Molle, S.T.R.I.K.E compatible vest, bag or rucksack. The BlackHawk S.T.R.I.K.E. 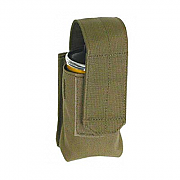 40MM Grenade Pouch holds up to three(3) 40mm grenades. 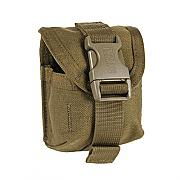 These Blackhawk pouches will securely hold your grenades as well as allow quick and easy access. The Blackhawk S.T.R.I.K.E 40MM Grenade Molle Pouch is designed by Blackhawk to hold two 4MM Grenades and is designed with the professional soldier in mind. 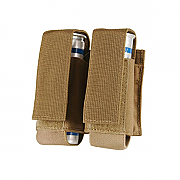 The 40MM Grenade Pouch will also hold two MK3 Pepper Spray in place of 40mm grenades. 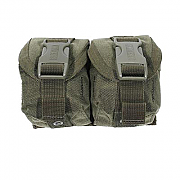 Blackhawk S.T.R.I.K.E Double Frag Grenade Pouch, 2-up grenade pouch for use with Molle system. The Molle S.T.R.I.K.E Double Frag Grenade Pouch was designed by Blackhawk to aid in speed and ease during military operations and assaults. Blackhawk S.T.R.I.K.E Triple Pop-Up Frag Grenade Pouch, 3-up grenade pouch designed for security and simplicity. The Molle Blackhawk S.T.R.I.K.E Triple Pop-Up Frag Grenade Pouch S.T.R.I.K.E Triple Pop-up Frag Grenade Pouch was designed by Blackhawk to aid in speed and ease during military operations and assaults.